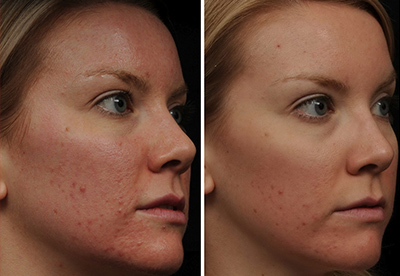 Remove Acne Scars Naturally in 6 Weeks! Amaira has developed a serum made from natural ingredients that produces great results without harsh substances or expensive clinical treatments. Use Amaira Advanced Scar Vanishing Cream according to the directions on the packaging to attain beautiful, clear skin that is free from unsightly blemishes. "Very good scar cream, I've seen good results so far and can't wait to see what happens after long term use. Smell is great and gentle and lotion feels good on my skin!" "Highly recommend this scar cream! I train in Thai Kickboxing and as a result I accumulate several scratches and scars on a regular basis. I also have sensitive skin so I can't use just any product. This cream makes a visible difference in the scars I have and it doesn't irritate my skin. Win-WIn! I can't recommend this cream enough!" "Wow! This is an amazing product and I highly recommend it to any one fighting those pesky stretchmarks after weightloss or pregnancy." "I've been using this scar cream for about a month now and I've started to see a change. I use it twice a day, once in the morning and once before bed. I've been using it on a surgery scar and it is noticeably lighter. I will continue to use and I know I will continue to see an improvement!" "IT REALLY WORKS!!!!!!! 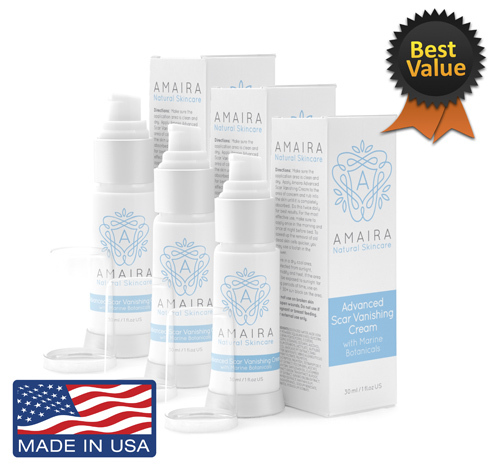 Amaira Advanced Scar Vanishing Cream is so much better than other high-end brands!" DID YOU KNOW ACNE SCARS CAN FORM IN JUST A FEW DAYS? Your body will immediately attempt to repair wounds when your skin is damaged. When it comes to acne, the pimple you see is just the start. When the pimple is gone, your skin starts the healing process. This can cause scar tissue to form, regardless of whether the pimple was large or small. These bumps are atrophic scars, which mean they're a form of depression or sunken area caused by damage to fat, collagen, or the other tissues that are present under the skin. To fix this, your skin needs to be nourished so that it can regenerate the tissues at every single level. Our Advanced Scar Vanishing Cream has been developed with this in mind, so it stimulates the growth and recovery of healthy tissue and reduces the appearance of your acne scars. HOW WAS OUR SERUM CREATED? Our Advanced Scar Vanishing Cream was formulated by Andrew Bryden, one of the most influential dermatologic chemist in the world. Andrew has developed hundreds of products over the last 22 years for many renowned physicians and product lines worldwide. The key to his success is using the highest quality medical-grade, clinical-strength ingredients. What sets Amaira apart from our competitors is the concentration, quality, and strength of those “miracle ingredients” used in our formula. Our medical-grade products are more powerful than anything you’ll find in department stores or over-the-counter. The Advanced Scar Vanishing Cream works by penetrating deep below the surface of your skin to treat unwanted blemishes from the inside out. The award winning formula includes Bentonite, which is essential in your body’s natural healing process. This vital ingredient helps rebuild damaged skin by reducing inflammation and fights off bacteria and infection in the process. Caprooyl Tetrapeptide-3 penetrates deep below the surface of your skin’s outer layer to slow the aging process by increasing laminin proteins, which hold cells and tissue together. Other acne scar products use ingredients that only treat the first layer of the dermis, making them ineffective for lasting change or true cell renewal. Powerful ingredients enhance the natural production of collagen and laminin, increasing elasticity and firmness of your skin’s outer layer. The award winning serum helps effectively combat the appearance of dimples, sagging skin, and fine lines or wrinkles. The award winning formula includes Bentonite, which is essential in your body’s natural healing process. This vital ingredient helps rebuild damaged skin by reducing inflammation and fights off bacteria and infection in the process. Caprooyl Tetrapeptide-3 have been scientifically proven to significantly stimulate natural collagen production, which reduces fine lines and wrinkles while giving your skin’s elasticity a boost. Shea Butter is a powerful emollient that hydrates and nourish your skin. B-Glucan is a strong antioxidant that fights off free radicals and encourages cell renewal so your old discolored blemishes are replaced with vibrant new skin with a healthy glow. "I love this product! I had red and dark spots on my legs from ingrown hairs (I'm super fair-skinned). I'd tried Mederma and not seen much improvement. This product seems to really be fading the spots and works the best on newer red marks, fading them before they ever become dark spots. I'll probably try to keep some on hand at all times because it really works on fresh scars/marks." "My younger brother fell off from a table facing his face. As a result, he got a lots scratches and scars. We used several creams from Walgreens but nothing worked. My friend recommended me about this cream and I thought let's give it a shot. Magically, after using for 4-5 times, I can already see scars fading. I don't know what kind of formula they are using but it does work. I'm really happy with my purchase." "I have been using this for 10 days on my c-section scar that is 10 months old, and I can honestly say that it is lightening the scar! It was very purple, almost brownish and I definitely see that it is lightening to a more pinkish color since using this. I can't wait 'til it's gone, and this product seems to be helping me on my way!" "It's only been a few weeks, but I can see a difference in my stretch marks. I have new stretch marks on the top of my breasts from my last pregnancy that are still red and make summer difficult. But I'm already seeing an improvement in the few weeks I've been using thing and I'm sure with continued use they will get much better." 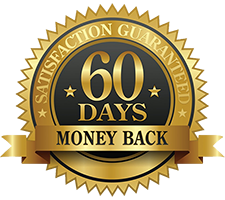 We're so confident that you'll love Amaira Advanced Scar Vanishing Cream, that we'll give you your money back if you don't! If you're not satisfied, we'll refund you - no questions asked. What does "scar-reducing" really mean? When we say "scar reducing," that's exactly what we mean! Your acne scars will be reduced. The texture, color, thickness, smoothness and overall appearance will improve. Is the serum okay for sensitive skin? Yes! Our Advanced Scar Vanishing Cream is made using natural ingredients, so you don't have to worry about side-effects. Does it work for severe acne scarring? Our active ingredients help your body regenerate skin cells and tissue to tackle even the most severe scars. Yes, Amaira Advanced Scar Vanishing Cream works for all skin types and skin tones. Will this make scars disappear? No product will make scars invisible. But we guarantee that you'll see a noticeable reduction in the visibility of your scars, or your money back. Does it prevent acne scars? Yes! A few of our active ingredients play an instrumental role in the healing process, keeping noticeable scars from forming. Advanced Scar Vanishing Cream is lightweight, smooth, and has been designed to not block pores. So no, it won't cause any unexpected breakouts! How long does each container last? This depends on how serious your scarring is. When used as directed, on average, one bottle will usually last around 1 month. Most people notice a difference after just a few applications. The biggest change, however, is usually seen after 3 months of use. Results will vary. All photos of before and afters, video testimonials, and written testimonials are actual users,. We do not promise or guarantee all users will experience identical (or equivalent) results to those portrayed in the results. All opinions expressed are strictly the views of the poster or reviewer, and not Amaira Natural Skincare.